There’s a feeling of excitement, anticipation and pride in the air at the TELUS Centre for the Performing Arts as graduates and their guests arrive for Michener’s 2018 Convocation. Among all the chatting and hugs between graduates, you would never know about the activity happening behind the scenes to make the ceremony run smoothly. This work going on in the background is what makes Convocation a success every year. 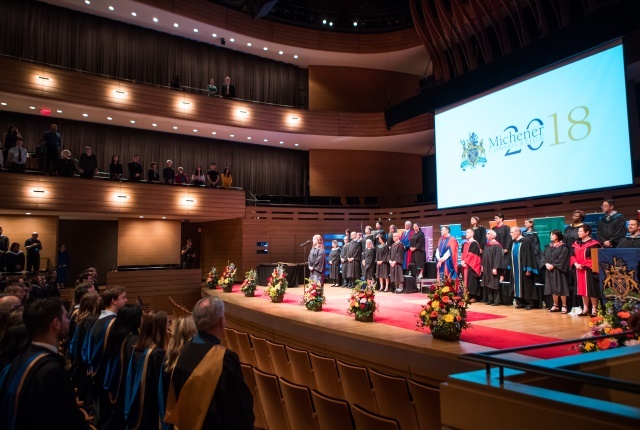 Unlike larger institutions that host multiple graduation ceremonies throughout the year, The Michener Institute of Education at UHN holds one Convocation ceremony annually where upwards of 200 students cross the stage. This year, it took place on June 16 with a record number of 289 graduates. The team behind the big day is a collaborative group of Michener staff that have taken on the project as part of their portfolio. This year, the planning committee consisted of three core members: Ray Nielsen from the Student Support Network (SSN) as Chair of the Committee, Nikolina Petranovic from the Centre for Academic Quality and Heather Wood from Academic Operations and Quality. Preparation can start as early as a few years in advance with securing the venue for a date in June. The Convocation Committee then begins meeting in early fall to start contacting vendors, preparing online registration and calling in support from various departments. “Pretty much as soon as it’s done, we’re thinking about what needs to happen for next year,” says Heather Wood. From graphic design needs to selecting the valedictorian and producing a list of students that are eligible to graduate, the team relies on the collective expertise of staff at Michener. “If it was just SSN, there’s absolutely no way we could do all this. We rely on assistance and support from other departments,” says Ray Nielsen, who was also the Master of Ceremonies for the event. On the day of, the Committee and their volunteers are on-site to distribute tickets, robe the graduates and ensure everyone is in the right place at the right time. But despite the many hours of careful preparation, things don’t always go according to plan. In the past few years, the team has witnessed a voiceover that missed an entire page of the script, misplaced robes and graduates that have shown up late. Despite the pressure, those involved can’t help but smile when they see how much this day means to Michener’s students and their families. “You may see some tears from family members as the graduates are going across. It’s just really heartfelt moments, and that’s probably the biggest takeaway,” says Ray. With Convocation 2018 wrapped up, the team has now turned their attention to preparing for the incoming class of students in September and starting the process all over again for next year’s graduating class. “When you think of Convocation as a whole, there’s a lot to get done and it can be overwhelming, but we’ve got it down to a really good science now,” says Nikolina.